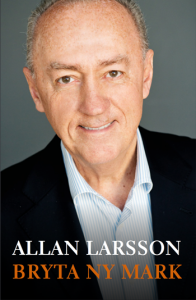 Allan Larsson has had a career as a journalist, Undersecretary of Labour, Director General of the Swedish Labour Market Board, Finance Minister, Member of Parliament, Director General of the EU Commission, chairman of Swedish Television and Lund University and a member of international commissions and advisory boards. He is currently involved in local development projects in Stockholm, Gotland and Småland and in a think-tank, Global Utmaning, in Stockholm. Allan Larsson was born April 3, 1938 in Bredaryd in Southern Sweden. After University studies in Lund he became a journalist, working as news reporter for Arbetet, Aftonbladet, Dagens Nyheter and Swedish Television and editor-in-chief of a weekly magazine, Vi. Research, administration and politics in Sweden. Between 1971 and 1974 he was head of the research department of the Swedish Metal Workers’ Union. In 1974 he was appointed Undersecretary of State at the Ministry of Labour. From 1983 to 1990 he served as Director General of the National Labour Market Board. In 1990 he was appointed Minister of Finance and in 1991 he was elected member of the Swedish Parliament. He was a member of the Board of Governors of the Central Bank 1992-1994. During his time in the Parliament he was appointed Chairman of the European Employment Initiative. He remained an MP until 1995 when he was appointed Director General in the European Commission in Brussels, responsible for employment and social affairs. During five years, from 1995 to 2000, he was in charge of the preparation and implementation of the European Employment Strategy. After retiring as Director General he served as Chairman of the Board of Swedish Television 2000-2005 and chairman of the Transatlantic Dialogue on Broadcasting and Information Society 2002-2005. He was also a member of the OECD Round Table on Sustainable Development in Paris 2001-2003 and personal representative of Director General Juan Somavia, ILO, to the Johannesburg Summit on Sustainable Development. In 2001 he became a member of UN Secretary General Kofi Annan’s High Level Panel on Youth Employment. He was member of the Albright-de Soto Commission for Legal Empowerment of the Poor 2005-2008. Between 2007 and 2009 he was a Member of President Barroso’s High Level Group on Energy and Climate Change. He has also been a member of the ETUC Reflection Group on Economic Policy and Employment in Brussels. In 2003 he was appointed Chairperson of the University of Lund, a post he held until March 2012. In 2007 he was appointed Chief Negotiator for Sweden’s offer to host ESS, a European multidisciplinary science facility; an agreement was reached in 2009 to build ESS in Lund. In 2010 he was in charge of negotiations to establish Medicon Village at the AstraZenec premises in Lund. He is a member of the Board of Mats Paulsson’s Foundation, owner of the Medicon Village AB. He has also been a Member of the Board of the Danish National Institute of Social Research in Copenhagen and a Member of the Advisory Committee on Leadership, Governance and Management of the Higher Education Funding Council for England, member of the Board of Centre for Environment and Sustainability, GMV, and a member of the European Panel for Sustainable Development at Gothenburg University. He is a member of the Royal Swedish Academy of Engineering Sciences. In 2011 he took the initiative to establish Hammarby Sjöstad 2020, a sustainable city project on electro mobility, energy, recycling, and water technology, now further developed into an innovation platform, ElectriCITY, with some 50 enterprises, research organisations and housing associations as members and partners. He is also involved in local development projects in Gotland – Forum Östersjön. He is a senior advisor to Global Utmaning, a think-tank in Stockholm. Jag läser med stort intresse dina memon, men i lika hög grad allt det framåtblickande. Websiten här ovan är en ledarskapssite – Motivation.se – som inte är min egen, men jag medverkar där som krönikör med en samling citat och aforismer (har samlat sådana hela mitt liv) som senare ska bli e-bok. Jag tänkte det kunde roa dig. Det är bra att vi seniorer håller i gång. My name is James Wine, an American writer and filmmaker and neighbor in Sjöstad. I would appreciate the chance to speak with you about both Sjöstad and Sweden. We are producing a documentary film aimed at the U.S. during next year’s election. The short of it is: I will use the Swedish example on climate change to show my fellow Americans, especially young voters, that it is indeed more than possible to decouple a thriving economy and carbon emissions: it happens everyday here. And it is a very good, clean and healthy life here. I would like to discuss how Sweden accomplished this – particularly the carbon tax – as well as lift up the example of Hammarby Sjöstad. The project’s bottomline is: if Hillary does not get a Congress she can work with… Well, the world cannot afford such an outcome. We don’t have another 8 years of American indecision. America must act boldly. And to that, a president needs congressional support – the power of the “purse strings” and the power of international agreements. This analysis, which prompts the film outreach project, comes from extensive conversations with Dr. James Hansen. His latest paper (July 2015) is an urgent plea. I became friends with Jim over my many years with the Tällberg Forum, also deepening my understanding of the problem through relationships with Anders Wijkman, Johan Rockström and others. There really is no safe scenario that works with the US being aggressive on climate. President Obama has done all he can without a Congress.But as Michael Mann (the hockey stick professor) put it last week: We thought that Paris would give us 10 more years to build up stronger actions, but Hansen has taken those 10 years away. This is the last Congress and President to be able to act fast enough…. This is the most important election in my lifetime. I know something of this process. My father played the crucial role in getting John Kennedy elected in 1960. This creative intervention into the election season next year includes both a documentary film and social media outreach. The film tells the Swedish story of its success as the Good Example. This is for those interested, the press, organizations, bloggers, universities, so as to get them to use the example to their audiences. But the real key is a social media ad campaign – ostensibly marketing the film in a non-partisan manner – to reach 50+ million voters with the essential message debunking the Republican “Action on climate will kill the economy” argument. The result we are looking for is to help bring 5 to 10 million more voters to the poll. That is the number people think will be enough to give Hillary a workable Congress. Americans need to be inspired by what works, not by what is failing. There will be many efforts to lift climate as a critical issue next year. From environmental organizations to Bloomberg. But none of these will have the unique and factual Swedish story. I understand it is “impossible” for Swedes to stand up and beat one’s chest and proclaim we are the best! It’s not your style and it would not work. Göran Persson told me that years ago. But, he added, you can! The best way I can help the Democrats (no Republican running accepts the science) is to present an American filmmaker’s viewpoint that backs her position on climate as a critical issue that crosses all borders that can be tackled successfully with common sense and a sense of the commons. I look forward to grabbing a coffee or beer with in our wonderful neighborhood. jag är ledare för ett projekt på Pufendorfinstitutet i Lund, inom vilket du blev intervjuad av Catherine Westfall förra våren. Vi har nu producerat en antologi som vi gärna vill skicka till dig – vilken adress ska vi använda? Vi vill passa på att tacka dig varmt för din medverkan! Jag vill skicka en hälsning och ett tack för mötet den 17 mars om avfallsminimering. Mitt arbete med återbruk av människor och hjälpa dem till studier och arbete är något som alla kommuner skulle vara skyldiga att jobba med. Min arbetsmarknadsavdelning är unik på många sätt och man måste hjälpa sin egna kommuns invånare. Jag jobbar med de mest allmänpolitiska frågorna arbetslösa, ungdomar, sommarjobb och integration och jag vet att kopplingen till cirkulär ekonomi passar in på flera av mina områden. Din presentation var väldigt intressant och jag fick en helt ny bild av Hammarby Sjöstad och blev imponerad av det kommande arbete som du berättade om. Jag hoppas att vi möts ytterligare en gång framöver.